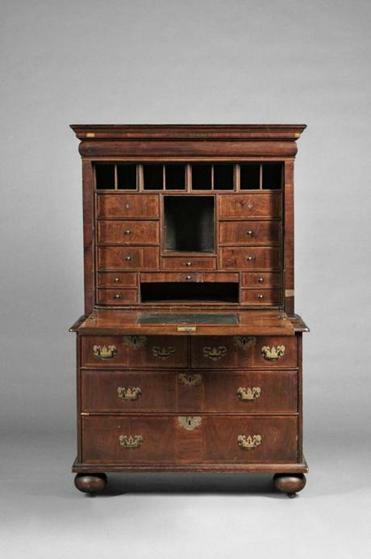 A William & Mary desk recently purchased by the Museum of Fine Arts for $270,000 at Skinner’s Americana Auction. A William & Mary desk, the only known example of an important English form made in New England, was purchased by the Museum of Fine Arts at Skinner’s Americana Auction this month. The 18th-century escritoire, or fall-front desk, sold for $270,000 or more than five times the high of its $30,000-$50,000 estimate. The only other known example was made in Philadelphia, so at first it was thought to be a Philadelphia piece. However, close scrutiny of the desk with its complex interior of compartments and 24 secret drawers led to its being thought of early New England origin. The desk, one of whose drawers was lined with an 1825 Providence Gazette, had been consigned to the auction by a North Providence couple uncertain of its provenance. Stephen Fletcher, executive vice president and director of the Americana department at Skinner, said in all his years with the auction house he had never seen a piece of furniture so scrutinized. One of those scrutinizing the desk was Dennis Carr, Carolyn and Peter Lynch curator of American decorative arts at the MFA. After finding three names written in old script inside the secret drawers, Carr said he felt strongly that it was a Rhode Island piece and that possibly it could be traced to the Child family of Warren. The three names were of Samuel, Nathan, and Rosabella Child, children of a leading 18th-century family in Warren, which at that time was a major shipbuilding center. Also found in the desk was a note handwritten in 1912 by George Gardner Bradford stating that the desk had stood in the old Gardner Homestead on Washington Street in Warren and that a drawer marked “Nathan Child 1792” caused him to believe the desk came through the Child family. The family history that curator Carr suspected was later confirmed when he located the desk in the 1738 inventory of James Child, the grandfather of the three siblings whose names were written in the desk. “Now we can trace the history of this object from the 1730s to the last owner. It never left the family,” Carr said. It is thought the desk probably was made by a cabinetmaker trained in England, who worked in the Colonies. The MFA also made a second acquisition at the auction when it purchased for $4,800 (estimate $800-$1,200) two daguerreotypes of the family of Roswell Gleason (1799-1887), the Dorchester pewter and Britannia ware maker, who introduced the art of silver plating to America. One of the quarter-plates pictures Gleason and his wife, Rebecca Tucker Vose, with their daughter, Mary Frances, holding a book, while the other family picture includes their sons, Roswell Jr. and Edward, in front of the family’s large Victorian home on a promontory overlooking Dorchester Bay. The parlor and dining room from Gleason’s 1840 Gothic Revival-style house, which was named “Lilacs” for the white lilacs planted on the property from cuttings made at Mount Vernon, in Virginia, are among the period rooms in the museum’s Art of the Americas wing. $9,000). The steamer sailed between New York and Savannah, Ga., and was commanded by Captain Henry Lewis of Marion, Mass. The second-highest price paid for furniture was $22,800 for an early-19th-century blue-painted octagonal-form baby tender, which had a $400-$600 estimate. The top seller from the collection of John T. Kirk, professor of art history emeritus at Boston University, was a late-18th-century red-painted shoe-foot hutch table that brought $16,800 against a $1,500-$2,500 estimate. A proclamation declaring Sept. 17 Massachusetts Furniture Day has been issued by Governor Deval Patrick, launching a statewide celebration of Four Centuries of Massachusetts Furniture. A first-time collaboration between 11 museums and cultural and educational institutions, Four Centuries of Massachusetts Furniture highlights Massachusetts furniture-making from the1600s to the present day through a series of exhibitions and programs. Participating institutions include the Colonial Society of Massachusetts, Concord Museum, Fuller Craft Museum, Historic Deerfield, Historic New England, Massachusetts Historical Society, the Museum of Fine Arts, North Bennet Street School, Old Sturbridge Village, Peabody Essex Museum, and Winterthur Museum, Garden and Library in Delaware. Seven museums will hold exhibitions, each focusing on a different aspect of Massachusetts furniture-making. “In the field of American furniture history, arguably no state has left a more remarkable legacy than Massachusetts,” said Brock Jobe, professor of American decorative arts at Winterthur and one of the founders of Four Centuries of Massachusetts Furniture. For more information about the exhibitions and programs visit www.fourcenturies.org. Virginia Bohlin can be reached at vbohlin@comcast.net.